Last year, Nick Matzke of the ever informative evolutionary biology blog “The Panda’s Thumb” posted a neat little graph where he made a comparison of hominin brain sizes in relation to body sizes. 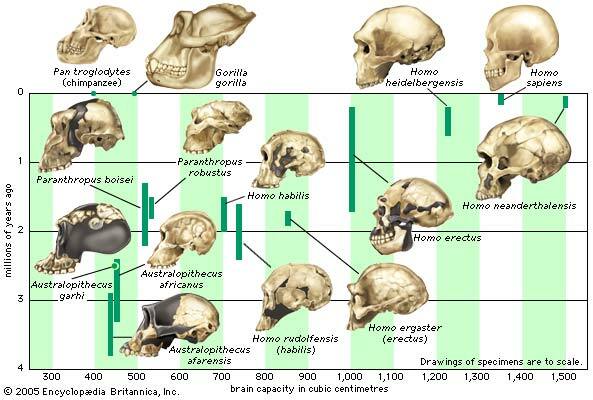 His post, “Fun with hominin brain size as a percentage of body mass” touches on one of my favorite topics in primatology, the evolution of primate brain evolution. One of the general characteristics that make primates unique are the larger brain sizes compared to body sizes in relation to other organism. His graph is limited in that it shows only the comparison of brain to body sizes of a tribe, within the family Hominidae, under a much larger taxonomic organization, the order Primates. This image (to your right) from the Encyclopædia Britannica, Inc. is a much illustrative but only depicts brain size evolution as a function of time. Robert Barton uses phylogenetic comparative methods to study the evolution of primate brains and behavior. His recent work has examined the evolution of neocortex size, the role of visual specialization in brain evolution, and ecological correlates of neural system evolution. “distinguished from most other mammals by superior cognitive abilities. Large relative brain size is the most obvious justification for this view. Why did large brains evolve and what is it that they enable primates to do? One way to tackle these questions is to examine which brain systems, with what functional properties, are associated with increased brain size. As noted, the neocortex is disproportionately expanded in primates compared with at least some other mammals, and anthropoid primates have larger neocortices than do lemurs and lorises. The fact that within primates variation in neocortex size relative to the rest of the brain is highly correlated with encephalization emphasizes the role of “neocorticalization” in primate brain expansion. I completely side with this advice Barton has given, however I don’t know how that will stop or prevent people from making conclusions in general. Many evolutionary biologists like Lewontin, Gould, etc. have argued (in the 70’s!) that we should not make ‘adaptionist’ stories to justify why we see certain adaptations… but it is still prevalent to this day. Also, let me personally interject on Barton’s advice by adding that in order to understand primate brain evolution we also need to decipher a larger understanding of comparative and functional genomics between primates. We need to understand what genes are facilitating the development of primate brains, and how they have changed throughout evolutionary time. I think the best way to read the Gould and Lewontin critique is along the lines of “adaptation is not an answer” that is, we can’t just be happy with a nice, plausible adaptationist story, but we have to go further and *test* it somehow. Fortunately, phylogenetics usually provides some way of testing adaptive hypotheses (in fact, I’d go so far as to say that it’s the single *best* way we have to test adaptive hypotheses, but my Ph.D is using phylogenetic methods, so I’m a bit biased!). For example, most the things you’ve mentioned above in the last paragraph are highly testable within a phylogenetic framework. Thanks for you comment. I totally agree with what you said. Phylogenetics does provide more sound, quantifiable evidence to draw upon conclusions. The problem with the comparative and functional genomics is that the research is just not done yet. We just finished sequencing the chimpanzee and human genomes, and gorilla, gibbon, etc. genomes are being sequenced. That’s one aspect of what needs to be done. Next is to compare the genomes to one another and also begin to decode the functions of the genes between primates, which is very hard in my opinion.